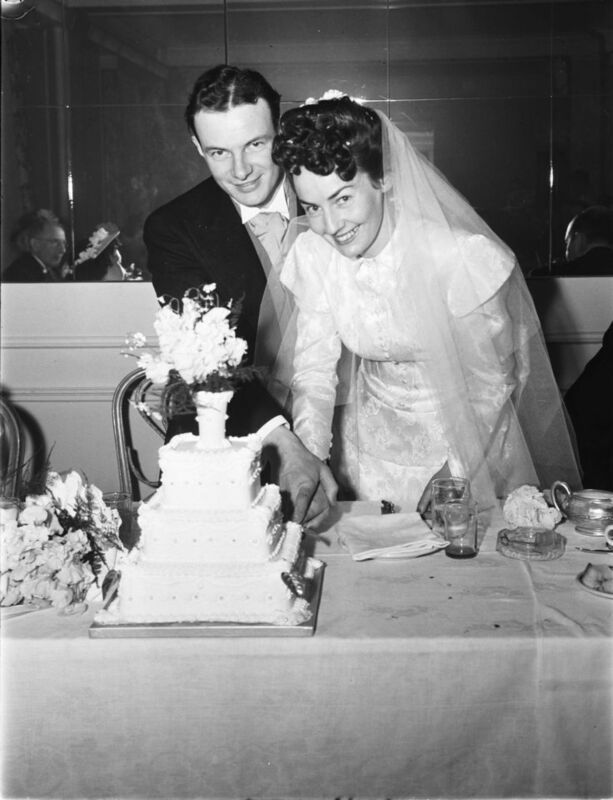 The cutting of a newly-married couple’s wedding cake is often the highlight of a Western wedding reception with newlyweds photographed making their first ceremonial slice into the cake. According to Western tradition the bride and groom should grip the handle of the knife together as they make this first cut. Traditionally wedding cakes in several Western countries consist of three cake tiers of decreasing size with the largest tier at the base and the smallest at the top. The top is usually decorated with symbols of marriage or good luck such as flowers or horseshoes, or figurines representing newlyweds. The wedding cake tradition probably stems from the Roman custom of breaking bread to symbolize unity. In Elizabethan times it was customary to bake spiced nuptial buns, but when British king Charles II brought French chefs to England around 1660, the chefs expanded the nuptial bun tradition by enveloping each bun in hard sugar, then decorating the buns with figurines. The buns were subsequently broken into pieces with the crumbs scattered over the bride’s head. 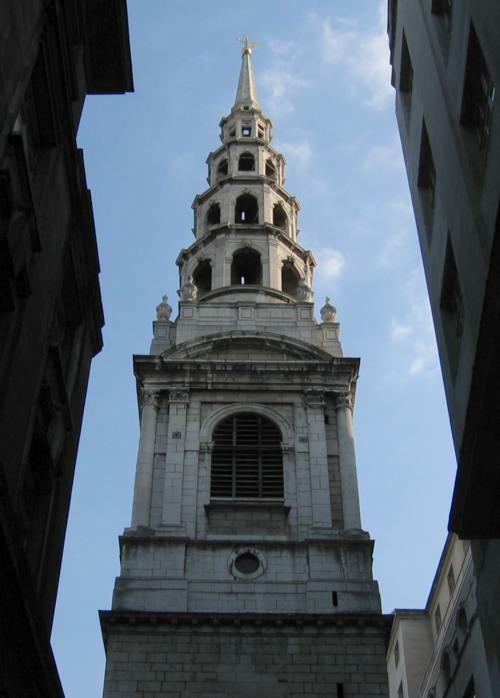 The multi-tiered wedding cake enjoyed today was invented by 19th-century English bakers with the triple-layered shape inspired by the silhouette of Saint Bride’s Church steeple in London that features tiers of decreasing size. Originally, there existed several types of three-tiered wedding cake, each intended for different classes and wedding budgets. It was only during the latter part of the 19th century that the term “wedding cake” was used to describe such cakes, replacing the earlier term bride-cake. British wedding cakes tend to be long-life fruitcakes as these keep well thereby allowing newlyweds to serve the top tier of the cake following the christening of their first child. Another British wedding cake tradition tells that unmarried guests, particularly bridesmaids, should place wedding cake under their pillow before sleeping, as this will help them find a spouse. In northern England a bride should throw a plate of wedding cake overhead to earn good luck – if the plate fails to break on hitting the floor a wedding guest should stamp on it to ensure good luck arrives. At weddings in France and parts of Belgium the croquembouche is served. The name croquembouche derives from the French “croque en bouche” meaning crack in mouth. This is apt as croquembouche is a tall, conical structure of cream-filled pastry buns enveloped in hard sugar. On top of the croquembouche are a set of figurines symbolizing the newlyweds. Similar to a croquembouche are the Icelandic wedding cake known as kransakaka and the Danish kransekage. These are wreath cakes consisting of multiple almond pastry rings of decreasing size placed one atop the other to form a cone of cakes. Each ring cake is decorated with white icing and the whole cake is filled with confectionary. According to Danish tradition the newlyweds should remove the top layer with the number of layers that adhere to it indicating how many children the couple will have. Other conical cakes include the spettekaka (spit or skewer cake) served at weddings in southern Sweden. A spettekaka takes the form of a towering meringue made by drizzling meringue mix over a conical, rotating spit. This cooking method forms layers of fine, crispy meringue that tastes of spun sugar. Once crisp, the layers are decorated with icing then cut into rectangles. Spettekaka has been baked in Sweden since the 17th century and traditionally two spettekaka should be made per wedding – one to stand on the bridal table, the other broken over the bride’s head. Similar spit cakes include the Hungarian kürtőskalács, which is also popular in parts of Romania, and the sakotis (meaning branched) that is served at Lithuanian weddings. Sakotis is made from biscuit-type dough formed into a spiky tree shape and baked until golden. The sakotis is decorated with flowers, herbs and chocolates that protrude from the top of the “tree”. In Poland, sakotis is referred to as sekacz or senkacz while in Germany it is called baumkuchen (tree cake). A similar cake, baamkuch, is served at Luxembourgish weddings. 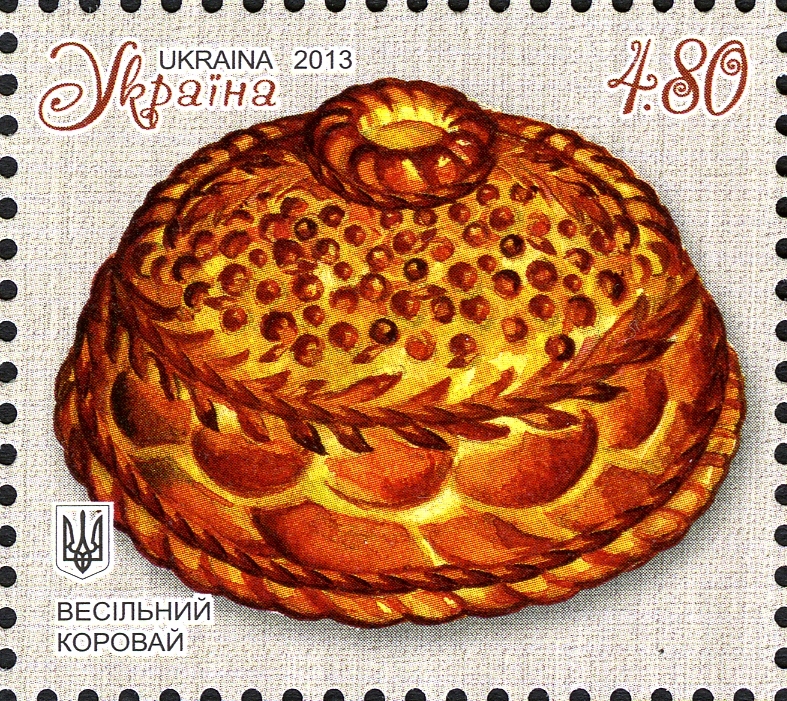 A particularly symbolic European wedding confection is the large, ornate round bread called korovai that is served at Ukrainian wedding receptions. Korovai is considered a sacred part of a wedding because it is decorated with symbols of eternal love and unity. Korovai is made over several days starting at the bride or groom’s house on the Friday or Saturday before the wedding. Members of both families take part in the ritual, for making the korovai symbolizes the joining of the two families. Korovai are usually made by women enjoying their first marriage for Ukrainian superstition holds that that the marital circumstances of the bakers passes on to the newlyweds – thus widows are forbidden to make korovai. The baking of korovai is highly ritualistic: the women making the dough wash their hands in holy water before binding it using a specially embroidered cloth. When the dough is ready to bake, one woman makes the sign of the cross over the shovel used to place the bread in the oven and also over the oven and on the dough. The women then pray together silently before placing the korovai in the oven. How the korovai looks when it emerges from the oven is considered extremely important. Ideally the bread should have a smooth exterior as cracks suggest the forthcoming marriage will end badly. It is also thought unlucky for a korovai to emerge from the oven twisted. The baked bread is transported to the church with the soon-to-be married couple where it is blessed. During the wedding, the korovai stays close to the altar before being taken to the wedding reception where it is placed in view of the guests. A wedding bread called brudlaupskling (or Bryllupskake) – a folded bread, topped with cream cheese and fruit syrup that is cut into squares – is served at Norwegian wedding receptions. Bread also features at Bulgarian wedding receptions; traditionally, the groom’s mother holds a loaf overhead and the newlyweds each pull one end of the loaf – whoever pulls the largest piece of bread will dominate the marriage. The newlyweds then feed each other the bread as guests shout “Gorchivo”. This means “bitter” and signifies that the couple should sweeten the bread’s bitterness with a kiss. After feasting, Bulgarian newlyweds receive their wedding cake, usually a honey cake that symbolizes sweet and happy marriage. At some Bulgarian wedding receptions the groom’s mother feeds the couple cake together with wine to guarantee their marriage will be successful. It seems that wedding cakes will continue to be an integral part of the wedding occasion for as long as weddings are an important ceremonial event within society. Moreover with the popularity of television programmes focused on baking and cake decoration, the proliferation of aspirational wedding magazines, and the influence of the wedding industry, wedding cakes may become increasingly elaborate and a long way from the spiced buns of the 17th Century. Williams, Victoria. 2016. Life Customs Around the World. ABC-CLIO. Charsley, Simon R. 1992. 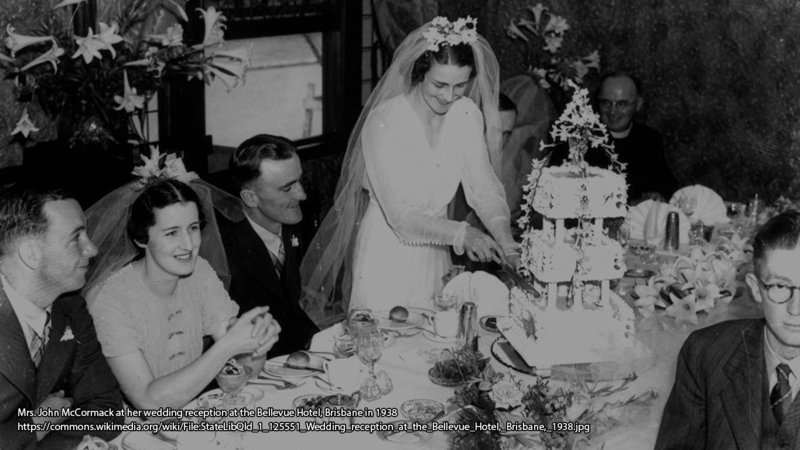 Wedding Cakes and Cultural History. Routledge. 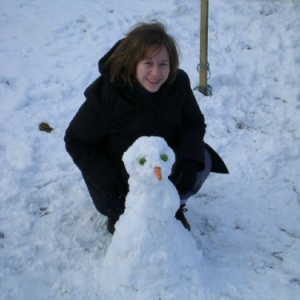 Monger, George P. 2004. Marriage Customs of the World: From Henna to Honeymoons. ABC-CLIO. Cyrwus, Oksana. “Wedding Bread – Korovai”. Ukraine Marriage Guide. October 16, 2013. Webb, Lois Sinaiko. 2000. Multicultural Cookbook of Life-Cycle Celebrations. Oryx Press.